Ecosoft took part in WQA Aquatech USA, the Water Quality Association's annual convention and exposition (from 21th till 24th April 2015). Ecosoft showcased its latest developments and the best products. Ecomix filter material for complex water was in constant attention as the know-how of the Company. P’URE is a next-generation Ecosoft™ personal water purification system. It embodies unique design and latest technology. Point of use reagent-free antiscaling medium Ecozon is an efficient prevention of scaling and sediment deposition on heating elements. 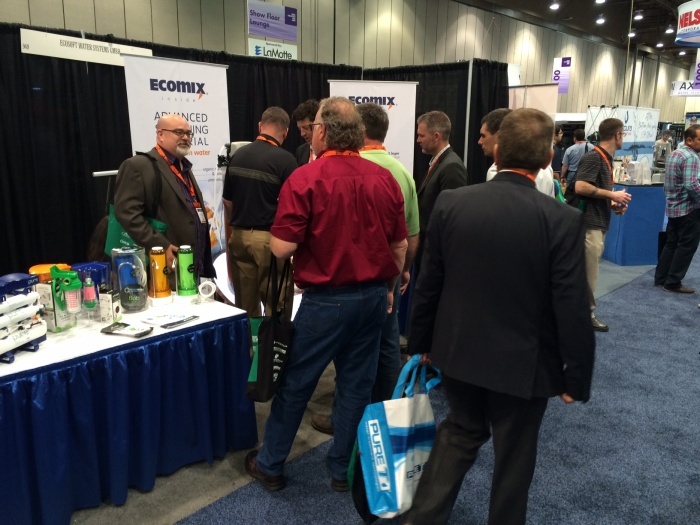 Ecosoft booth was attended by thousands of water professionals seeking to become Ecosoft partners. WQA Aquatech USA 2015, the Association’s annual convention and trade show, promises a range of value and opportunity from navigating governmental challenges to test-driving WQA’s new education program. WQA Aquatech USA is the trade show and conference aimed at the Western American Water Industry which includes process water, drinking water, and wastewater for residential, commercial, ultrapure and industrial uses. © 1998-2015 Ecosoft, Inc. All rights reserved.